The system worked perfectly, saved me a lot of time and effort. I will certainly be using it for all our bulk mailings from now on. I have used Docmail directly before, your software makes it so much easier to use. 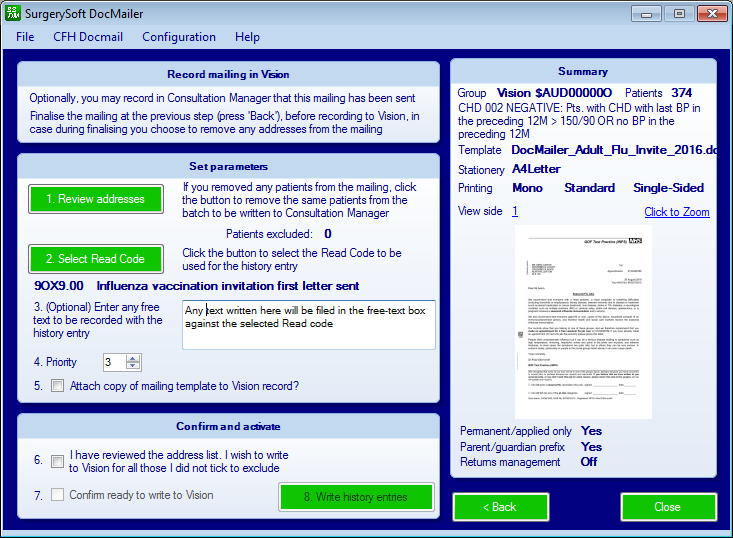 Have just used this software for all our flu invites. Wow, so much time, money and effort saved. So glad I read this email the other day. Thank you! Just used it: very, very impressed with it. I'm training up someone to take over the recall work from me and it will be so much easier showing her how to use DocMailer. Thank you very, very much! SurgerySoft DocMailer (free of charge to Vision practices) makes it really easy for practices to save staff time and money by using the low-cost mailing service from CFH Docmail Ltd for bulk mailings such as flu reminders and QOF recalls. SurgerySoft DocMailer is FREE and saves you a significant amount of money and staff time on bulk mailings. 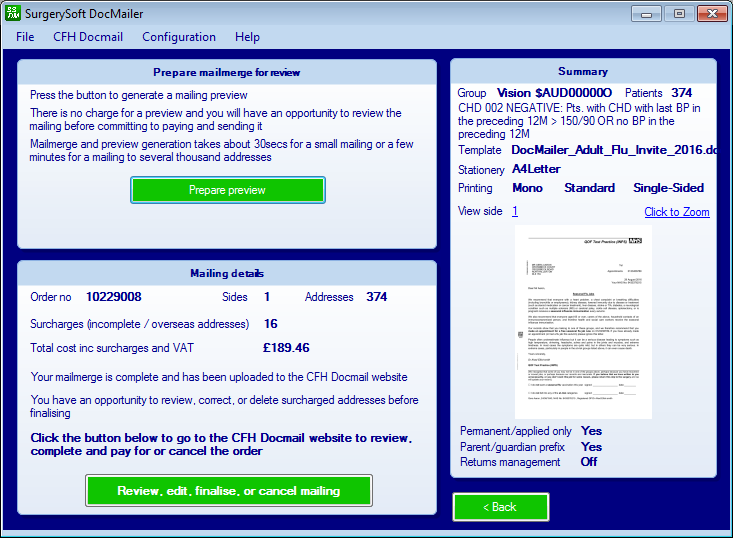 It does this by making it very easy to export mailmerge details from Vision directly into the low-cost mail service from CFH Docmail Ltd. This service doesn't only post your letters. Included in the 54p price (inc vat) per letter is paper, envelope, toner, printing and postage. It prints the letters and puts them in their envelopes, and takes them to the postbox for you - a significant saving in staff time and stationery expenses for bulk mailings such as flu invites and QOF recalls. For mailings which don't include confidential data you could consider using their postcard service which is even cheaper from 50.4p (inc vat) printed and posted. Compare that to a second-class stamp at 56p, which doesn't come with printing and posting included! 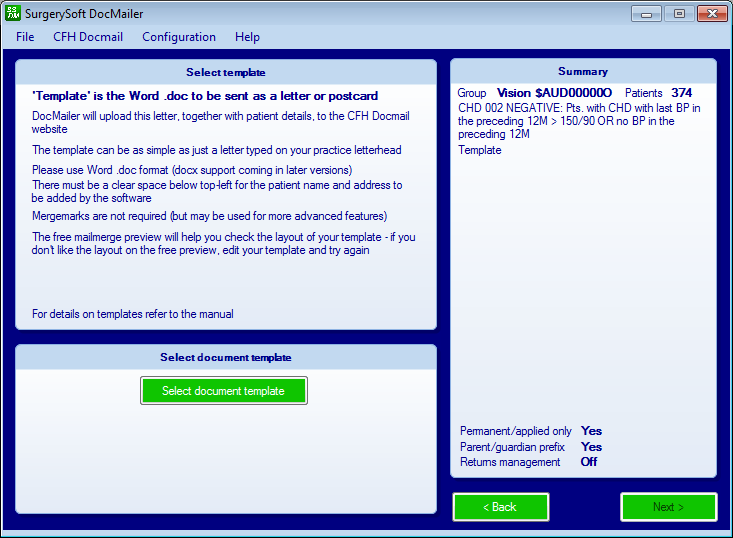 You can use CFH Docmail without SurgerySoft DocMailer by manually processing Vision groups into csv files and uploading them to the CFH Docmail Ltd website, but SurgerySoft DocMailer is FREE yet makes the whole process so much easier and quicker. 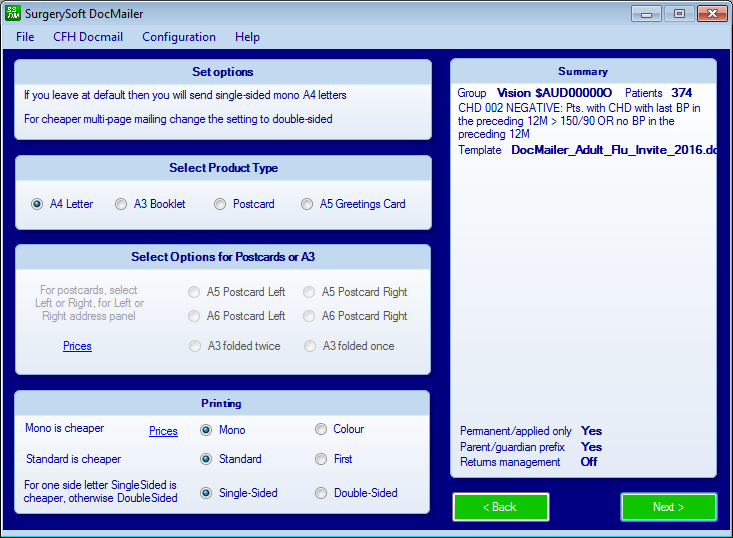 Just a few button presses to select your Vision group and your letter template and SurgerySoft DocMailer does the rest. If you are a current SurgerySoft customer, just login to access the download. Otherwise, complete the order form, where the price is set to FREE, and submit the shopping basket (you will not be charged). When the basket is processed we'll give you the download password. Order DocMailer. Read the Information Governance statements and documents from CFH Docmail Ltd. This product is supported by SurgerySoft, not by Vision. For any queries please contact SurgerySoft help desk, not Vision.